Below you can be informed about the famous Greek Islands, you can find the names of all the islands, their geographical position and in which complex each one belongs, so that you have an idea where you are going to spend your sailing holidays. The Greek Islands are a collection of over 6,000 islands and islets that belong in Greece. Only 227 of the islands are inhabited, and only 78 of them have more than 100 inhabitants. The largest Greek Island is Crete, located at the southern edge of the Aegean Sea. The second largest island is Euboea, which is separated from the mainland by the 60m wide Euripus Strait, and is administered as part of the central Greece periphery. After the third and fourth largest Greek Islands, Lesbos and Rhodes, the rest of the islands are two thirds of the area of Rhodes, or smaller. 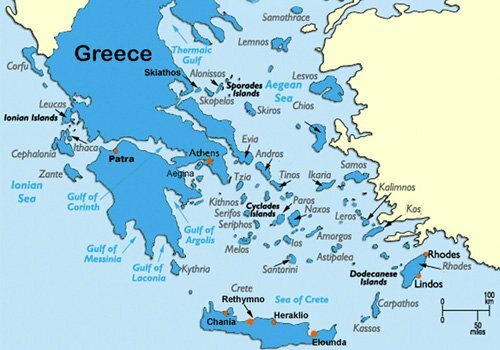 The Greek Islands are traditionally grouped into the following clusters: The “Argo-Saronic” Islands in the Saronic Gulf near Athens, the “Cyclades”, a large but dense collection occupying the central part of the Aegean Sea, the “North Aegean Islands”, a loose grouping off the west coast of Turkey , the Dodekanese, another loose collection in the southeast between Crete and Turkey, the “Sporades”, a small tight group off the coast of Euboea, and the “Ionian Islands”, located to the west of the mainland in the Ionian Sea. The Argo-Saronic Islands are so called because they lie between the Saronic and the Argolic Gulf, with the result Argo-Saronic Gulf and Argo-Saronic Islands. In this complex you can visit Aegina, Angistri, Poros, Hydra, Spetses and Dokos. In the Saronic Gulf the main Island is Salamis, where the Greek Navy defeated the Persians in the battle of Salamis. In the Argolic Gulf, the mai Island is Bourtzi, a small Island with a castle which is now a monument. The gulf is crossed by ferry routes from Nafplio and Spetses and Leonidi. The cities and towns that lie next to the gulf are: Leonidio, Astros, Myloi, Nea Kios, Nafplio, Tolo, Iria Beach, Porto Cheli. The islands are peaks of a submerged mountainous terrain, with the exception of two volcanic islands, Milos and Santorini. The climate is generally dry and mild. Cooler temperatures are in higher elevations and mainly do not receive wintry weather. In transportation, the Cyclades is the only prefecture in Greece that is not linked with a state-maintained highway or a highway number. All of the roads in the island complex are secondary or provincial. The North Aegean Islands are a number of disconnected islands in the north Aegean Sea. The main islands are the Greek islands of Samos and Ikaria, Chios, Lesbos, and Lemnos. The main islands in the Thracian Sea in the far north are the Greek islands of Samothrace and Thasos. The Dodekanese Islands, literally “twelve islands”, are a group of 12 larger plus 150 smaller Greek Islands in the Aegean Sea. They have a rich history and many of even the smallest inhabited islands boast dozens of Byzantine churches and medieval castles. The Sporades islands are an archipelago along the east coast of Greece, northeast of the island of Euboea, in the Aegean Sea. It consists of 24 islands, of which five are inhabited. Alonissos, Skiathos, Skopelos, Peristera and Skyros. The Ionian Islands are traditionally called “Eptanisa”, meaning: “The Seven Islands”, although the group includes many smaller islands as well as the seven principal ones. The seven are, from north to south: Kerkyra usually known as Corfu in English, Paxi also known as Paxos in English, Lefkada also known as Lefkas in English, Ithaki usually known as Ithaca in English, Kefallonia often known as Cephalonia in English, Kythira sometimes known as Cerigo in English.